Well.... technically it's our Photovoltaic System but that doesn't sound as nice. Please to enjoy our latest baby step in completing our studio/office: a diagram of how we make our own electricity. Unbeknownst to us or our electrician, our solar electric system was not permitted with Maui county. It's a long convoluted story, but there you have it. The electrician who originally installed the system (about 5 years ago) never filed a permit to do so. There was a bit of fuss last week when we were told we were going to be fined, shut down and that we'd have to apply and pay for a new permit. Talk about drama. yeeesh. And, to make it even more aggrevating, the county just raised the fee for PV permits this year. Our electrician dutifully drew up some plans (literally with a pen and paper) outlining our system specs and took them to the county office. But he was turned away, laughed at, made a mockery of, etc... So he remembered we were graphics guys and asked if we could draw up some fancy plans on the computer. Three hours later, we created what you see above (click it to see the larger version) I called him yesterday to find out how it went and he said they practically applauded. Problem solved. I don't really mind having to jump through these hoops, it just should have been done already--like when it was installed. I could see why the county needs these specs for systems that back-feed to the grid. But in our case, being that we are a stand-alone system, I don't see the value in them spending their time and resources. Especially, since we knew we were going to be responsible for our own electricity as stated in our deed so we have no legal right to hold the county responsible for anything that happens in regard to our electric (or our water-catchment system). But thankfully, it's done. 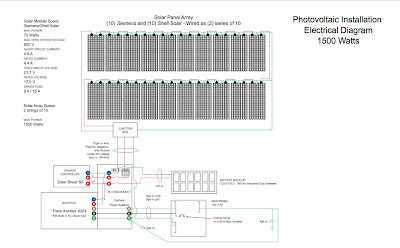 And on the bright side, we now have a detailed illustration of how our system works... and how we get by on only 1500 watts is a small miracle. the way you handled this potential throwy-uppy situation is nothing short of BRILLIANT. again, good on ya, guyz. and once again your choice of words made me cackle! i love that. it's going to be my new favorite phrase. "throwy-uppy" perfection.